So I totally stole this recipe from my sister and her husband…props to Beth and Brian for creating such a odd yet yummy mix for healthy enchiladas! Actually we ate them more like a soft taco than an enchilada, but I guess when you are the one cooking it you can call it what you want. Chicken – I added that on my own…I don’t think chicken was part of the original recipe, but I could be wrong about that. 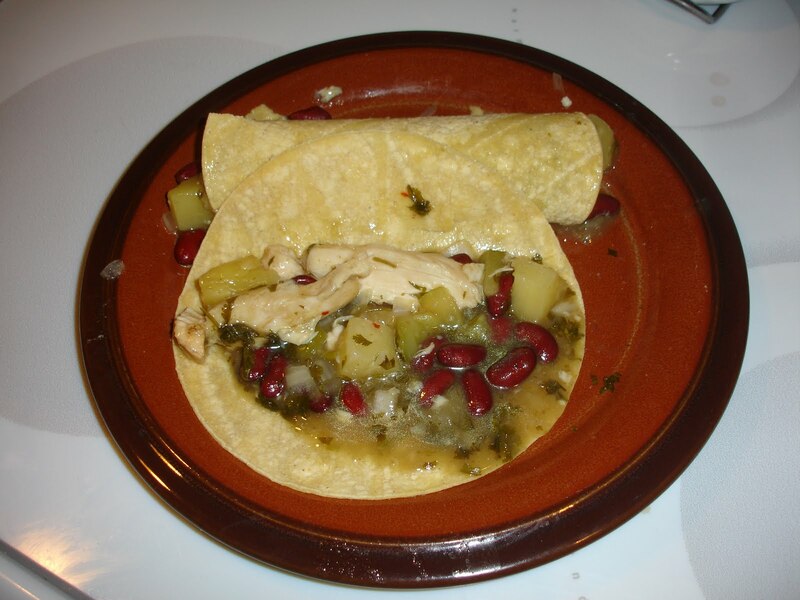 Warm tortillas and fill with mixture from crock pot. I suppose you could add sour cream and cheese on top with a little more enchilada sauce on top if you wanted to make enchiladas, but we went plain with the tortillas and the mixture from the crock pot. Sorry there are not measurements on how much of each…I just did it until it looked like there was enough of each thing to taste good. If you are a structured cook (sort of like me) embrace the lack of measuring and just eyeballing it…it was sort of freeing! < Previous Conversation of the Week! Next > First Dodgeball Game!